This post evaluates the performance improvement of Scala parallel collections ovr mutable and immutable collections. 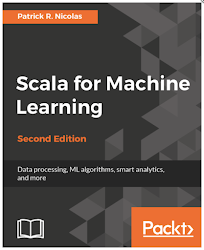 The Scala standard library includes some parallel collections which purpose is to shield developers from the intricacies of concurrent thread execution and race condition. The parallel collections are a very convenient approach to encapsulate concurrency into a high level abstraction similar to the traditional data workflow, scientists are familiar with. Parallel computing is supported for some collection using the par method as listed below. The next step is to create a set of benchmark test classes, ParArrayBenchmark and ParMapBenchmark that automates the performance evaluation of parallel arrays and maps over an arbitrary number of tasks, nTasks. The first step is to define a timing function (line 1), that executes a function g for times iterations (line 4). The benchmark is parameterized for the type U of elements in an array. The constructor takes an Array (line 2)and a parallelizable array ParArray (line 3) as arguments. The benchmark ParArrayBenchmark evaluate and compare the performance of an array and a parallel array for the most commonly used higher order methods: map (line 6), filter (line 14) and reduce (line 22). The benchmark is flexible enough to support any kind of method argument f with any type U for all three methods; map, filter and reduce/. The scala classes ForkJoinTaskSupport and ForkJoinPool are wrappers around the Java classes, ForkJoinTask and ForkJoinPool. ForkJoinPool (lines 8, 16 and 24) provides Scala developers with a very efficient way to manage threads pool: It executes nTasks tasks that are potentially created by other tasks. The tasks are implemented using Java threads, managed by an executor service, familiar to most Java developers. Let's create a benchmark for evaluating the performance of parallel maps, similar to the benchmark on parallel arrays. Once again, the evaluation methods map (line 7) and filter (line 21) are flexible enough to accommodate any function argument f of any type U. The implementation of these two methods follows the same pattern as the one use for the parallel array. The duration of the execution of map and filter is computed through the timing method, introduced in the previous paragraph. 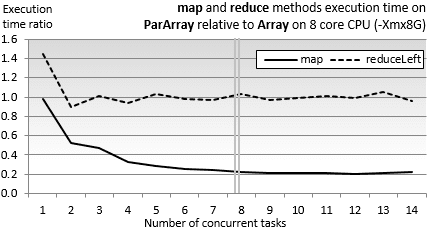 Let’s look at the relative performance of the map task on a single threaded Array and a parallel array ParArray. Let's use fairly simple mathematical functions mapF (line 2) (resp. filterF (line 5) and reduceF (line 8) for evaluating the map (resp. filter and reduce) functions on array and parallel arrays. The arrays are create and populated with random values (lines 10 & 11). The reducer doesn't take advantage of the parallelism of the array. The reduction of ParArray has a small overhead in the single-task scenario and then matches the performance of Array. 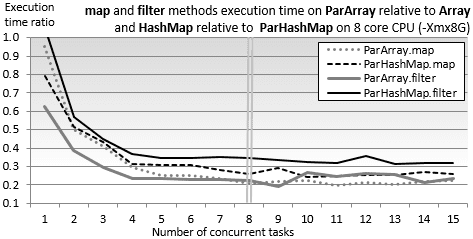 The performance of the map function benefis from the parallelization of the array. The performance levels off when the number of tasks allocated equals or exceeds the number of CPU core. We reuse the mathematical functions for evaluate the map, filter and reduce functions used for arrays in the test client code. The impact of the parallelization of collections is very similar across methods and across collections. It's important to notice that the performance of the parallel collections levels off at around four times the single thread collections for fie concurrent tasks and above.